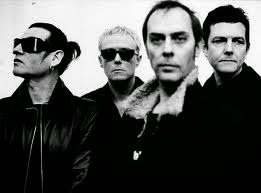 Well who ever thought Bauhaus would get back together, AGAIN? They originally broke up in 1983, Then reunited in 1998. Then again in 2005. They initially played in the USA and Canada in the Autumn of 2005, which is where this gig is from. Originally released as a limited edition on CD-R in 2006 I believe. Its been long deleted so should be safe to post here; I found it on a blog site some years later. I've EQ'ed it a bit and I think it sounds great. Now available as a 320 kbps mp3 for the first time, the show is available for download HERE as 1 MP3 file. Or, if you would like to have separate tagged MP3s, or even lossless files in FLAC format, head on over to the Donations tab to see how you can obtain these for a very small donation towards the site costs. I was wondering (being a bit nerdy meself!) is there any chance of getting all these concerts in FLAC? I see that there are a fair few and starting all over again I'm sure would be depressing for you! Anyway, just wanted to ask. Don't hesitate for the concert I mentioned. The setlist is similar but the atmosphere might be different what with it being Halloween and all. Hi, many of the gig recordings I have are lossy format to start with. All of the remasters I've done have been saved as 320kbps mp3 - so saving a remaster as FLAC won't really make a big difference in sound quality. Redoing remasters isn't really a good use of my time I'm afraid - most people are happy with the mp3s and I have a long list of new gigs to do. Its possible that original gigs I DO get in FLAC format could be remastered and saved as flac as well as mp3 in future. Thanks for the suggestion!